Hong is alway begging me to make my bo tai chanh. Even though it’s a classic Vietnamese dish and really simple to put together, it’s uncommonly found in Vietnamese restaurants. Recently we were invited to a party so Hong helped me make this dish to bring along. A direct literal translation to English means “rare beef lemon” but that just doesn’t sound appealing. 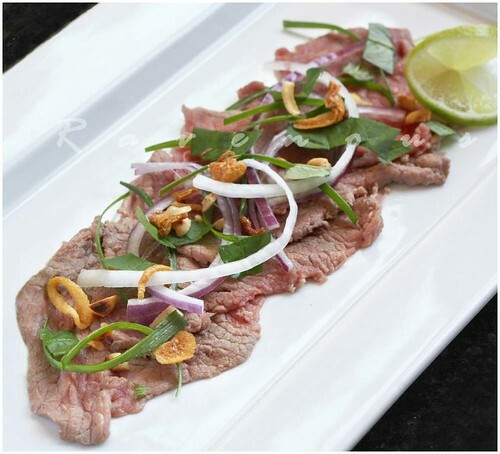 It’s similar to carpaccio in that it’s thin slices of beef– except that it’s cooked with the acid from citrus–so is it more like a meat ceviche? You might be reminded of rare pieces of beef in pho tai without the pho. Regardless, this dish is one of Hong’s favorite and judging by how fast it went at the party–you might like it too. This is a great appetizer that can be served alone, with shrimp chips, or black sesame rice crackers (banh da). Beef round eye and tenderloin are great cuts for this dish but you can fancy it up with filet mignon if you wish. Have your butcher slice it as thin as possible for you. If they don’t provide this service, try what I did when I went to school at the University of Michigan: quick freeze the meat outside in -10 degree weather for 30 minutes before cutting it…but of course, you can use your freezer. Mix lime or lemon juice with sugar until dissolve and set aside. Traditionally, the meat is cooked by citrus acid, but we always make large quantities and don’t have the time to wait. So we use a shortcut which we think still tastes great. Fill half of a medium size sauce pan with pineapple juice and heat to a rolling boil. Quickly “blanch” some of the beef a bit at a time, no more then a few seconds or so removing it as it turns slightly opaque but still quite rare. Place in large mixing bowl. Add the lime or lemon juice mixture and mix well, letting the acid do the rest of the cooking about 15-20 minutes, but use your judgement as to when to remove it from the acid. We like it pretty rare. Drain and squeeze out excess liquid from the meat. Mix in the onions, rau ram and drizzle with a bit of nuoc mam dipping sauce (don’t over do it as you don’t want to overpower the fresh citrus taste) and mix well and adjust to taste. Transfer to serving platter and top off with crushed roasted peanuts, shallots, and jalepeno. We never make anything for two! We hope everyone had a safe and happy 4th of July. As immigrant families from Vietnam, we both cherish the freedoms and opportunities of America. As with most Vietnamese American families, ours were deeply affected and involved in the Vietnam War. Our families both escaped Vietnam as refugees and “boat people” nearly 30 years ago…Sponsored by Catholic churches, both of our families ended up in Michigan. But my family sought warmer climates of Southern California while Hong’s stayed. 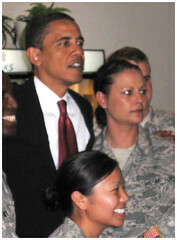 I have a cousin who had three tour of duties in Iraq and Hong’s sister (below) is currently there. We both are grateful for them and all the troops for defending our country. Oh my oh my that looks amazing! So light but flavoursome! The sad thing is I love Vietnamese cuisine, the recipes and flavours, but have yet to taste it! Mmm, that makes me hungry even though I've just had dinner. Happy 4th July to you & thanks for coming by my blog! Thanks for stopping by my blog. Your beef carpaccio looks amazing. I'm so glad to have discovered a place to learn about Vietnamese cooking… and American patriotism! mmmmm….that looks oh, so appetizing. hope you both had a wonderful 4th of july! oh my! so bursting with flavors and perfect for summer! Bo Thai Chanh has always been one of my favourite Vietnamese salad and I'm happy to have a recipe now! Thanks! It is still breakfast time and I'm craving beef! This looks amazing. Thank you for stopping by my blog, and I'm glad to have found yours! This looks truly, truly amazing. This type of meat salad is my all-time favorite. It's so light yet filling at the same time, if that makes any sense. Thanks for teaching us how to make this. That beef looks really good topped with all of the fresh herbs and onions. My Vietnamese mom totally refuses to ever make this dish! She's totally big on cooking beef until it's rubbery and well done b/c she thinks its healthier. I, on the other hand, love my meat red and raw. Thank you for indulging me, I may have to tackle it myself. Such lovely photos, too! umami's definitely worth a try! btw, love your food pics! Fantastic recipe! I like my meat practically moo-ing, so this is right up my alley. Your tip about lightly freezing the meat before slicing is right on the money – it always makes slicing thinly so much easier. You've done it again! Bo tai chang looks delectable. Happy belated 4th to both of you. Ruth: Thank you… Vietnamese food is really pretty simple…no real advance technique so give it a try! 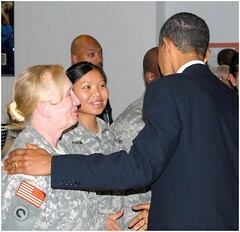 Margie: Thank you very much…we're very proud of the family members who have and currently serving. Giao: Thank you and happy belated 4th to you. July is our favorite month in Seattle…hope you have a blast. Rita: Yeah it's surprising light and perfect for summer. Mathildecuisine: Please let us know how it turns out if you make it! Phoo-d: Likewise, glad to have discovered yours as well! Leela: It totally makes sense and makes for great eats! Kevin: Thank you again for the printable recipe tip. Cynthia: Red and raw…yumm Please let us know if you do make it! jeannie: thank you! we'll have to try it one day. cookin'canuck: Thank you! The quick freeze def. does the trick! Gastronomer: Thanks! happy belated 4th to you guys as well! i will make this for my husband this weekend! thanks! Sounds like the perfect summer salad (light yet filling). I'm always asking for my bo tai on a separate plate when ordering it with pho because I like it rare, I bet the texture is awesome when "cooked" in lime juice. Marc: We totally agree that's definitely the smart thing to do when order pho tai as most of the time by the time it comes out to you, it's already way too cooked! kitchenhacker: It's easy to make…try it! 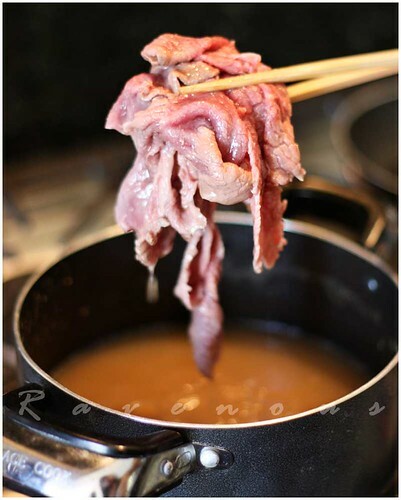 I am doing the same dish, but I use the broth of a Pho to slightly cook the meat. My recipe is in french, but I will translate it and put it on my blog. Kha: thanks for showing us your recipe! Jackie: That's great idea! We've actually seen some people sauteeing for only a few seconds..so there's definitly differences in technique. Hoisin and sriracha is always a great flavor combination! Wow, guys, this looks amazing. I am an immigrant myself -from Italy though- and I love carpaccio. I also happen to love Vietnamese food, so to find a dish that puts the two things together is a real treat. Will check out your website regularly from now on, I'm looking forward to learning new Vietnamese recipes! Chiara: Thanks for discovering our blog and taking the time to comment. 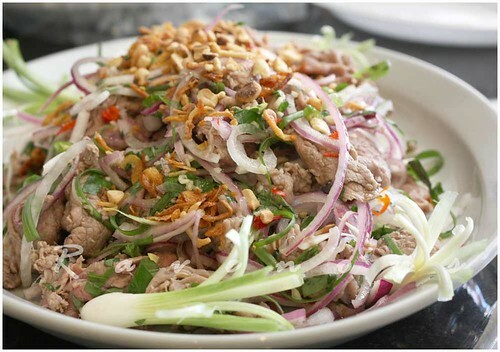 Bo tai chanh isn't exactly carpaccio, but it's the closest way to describe this dish! I made this recipe last night and the hubs ate all of it. It's so good. Was wondering if you have a recipe for Muc Rang Muoi. It's usually fried and served on a bed of lettuce. Hi, I made this last night and it was pretty good. I think the only ingredient it was missing was the rice paddy herb, which would have pulled the dish together perfectly (and a side of mam nem, which is probably too pungent for most people, but I LOVE IT!). Thanks for the recipe! easily one of my favorite vietnamese dishes. I have to try this recipe, it looks amazing! Do you know if we can make this a day ahead? Thinking of adding it to our Vietnamese-American Thanksgiving menu. 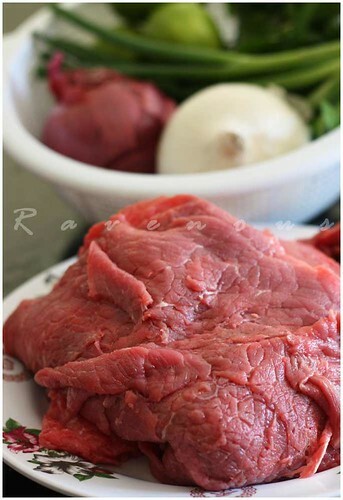 I was searching for spicy sweet raw beef cured with fresh herbs/pineapple-lime juice;ur blog recipe popped up. I have wild pig and venison tenderloins to use up;your recipe is close to what I remember a close friend(from Vietnam-recently passed away);made for “Special Occasions.” Her daughter makes an extremely firery hot mashed raw beef marinated in nuoc mam,fresh pineapple/lime juice and fresh mashed herbs. This”Paste” is then served with fresh bean sprout and leftover rice wrapped iin a lettuce leaf. i’ve enjoyed the time we’ve just shared…Peace and Health be with you in the Garden.